A new framework is required to remedy an overemphasis on staged healing events in churches. A practice that hampers or even destroys the message of the Good News within the public realm. If you attend almost any Charismatic church meeting, you are sure to hear about supernatural healings. They are usually abstract ones such as headaches banished, a sore back relieved, a short leg lengthened, and many other unusual conditions cured. The majority are scientifically unproven because they are too vague. There are serious problems with this practice that need clarification. This whole phenomenon almost parallels the excess of Medieval Catholicism; a state which inspired both the Reformation and the Renaissance. Mysticism along with its healing progeny have paralleled the Christian experience from inception and the lineage can trace even further through Jewish sources. The call for divine healing may also be as old as humanity. In today’s world with the application of science-based techniques, there is much less emphasis on direct divine intervention. However, certain contemporary Christian movements, especially the Charismatic and Pentecostal ones, have pushed their practices of divine healing to the forefront of public recollection. Some of these practices and some leaders within the movement have brought Christianity as a whole under suspicion and a central source for rejection and disrespect. There lacks a contemporary ethical compass or strong leadership in these groups to curb abuse. The solution is not hard to achieve. Past theologians and philosophers have already established a favorable framework that allows for the existence of divine intervention in a controlled accountable manner. Many of the solutions that were applied back then have usefulness for today’s experience. This article delves into a few theologians and philosophers to build a proper framework for 21st-century Christian living. There is no question with God miraculously intervening in any given situation. It is a problem of application and abuse that is happening here. Many readers are probably asking, who is a Charismatic, and why should I care? The following answers these questions. These are people mainly from the 1960s onward inspired with the Pentecostal wave that started in the early 1900s. They initially continued attending their Anglican/Episcopalian, Baptist, Methodist, and other mainline churches. They tried to bring their spiritual awakening to their traditional brethren but did not succeed. The result was that many of these people voluntarily left or were forced out. As a consequence, these people formed their independent churches. These collections of independent churches are called the Charismatic movement. One of their attributes, apart from their emphasis on the supernatural, is the autonomous nature and avoidance of denominational or sectarian features. Because of this, there is a wide range of expressions and practices within the charismatic movement. There is no key leader, church, or theologian that represents them. Dialogue and cooperation exist between these independent churches, but no desire to form a hierarchical structure. Those churches that remain in their denominations but are deeply influenced by the Charismatic movement are called Third Wave churches. These often emphasize healing services. The practice of divine healings is typical of a Charismatic liturgical experience. Their central doctrines emphasize a mystic union with God through the baptism of the Holy Spirit, speaking in tongues and sensitivity to the supernatural. Divine healings is an integral part of their religious identity. 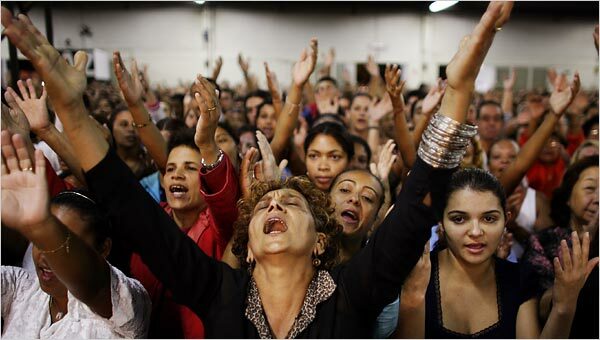 However, there are severe problems with the mystic rite that the charismatic movement must address. First of all, the public exhibition of divine healings strengthen public sentiment that those practicing are radicalized religious fanatics. It scares the general populace more than attracts. This healing practice, which is perceived as a staged act rather than fact by most members of the public, also further alienates the Christian faith from being a regular participant in public social dialogue. Secondly, the staged process of divine healing undermines the credibility of the message. A high percentage of the general public is hostile and openly antagonistic to Christianity because of the contemporary healing practices by Church leaders and Evangelists. They usually quote faith healers they have seen on television, the radio, or in print magazines to back up their refusal to discuss any matters of the Christian faith. This leads to a serious concern. Unless the various branches of the Protestant churches seriously confront the problems of perceived fraud and lack of accountability in the practice of divine healing, then a severe public relations problem exists. The lack of discipline may lead to a tipping point; some abuse relating to divine intervention will spark the already existent anti-church sentiment and will set a precedent for government intervention. As a result, this will send a terrible message that the church, which is supposed to pursue and encourage moral excellence, instead is an institution that cannot govern itself, nor be considered reputable. Whose fault is that? Is it a war on the church or is it a backlash the church has created for itself? This is not the first time in history that an overemphasis on the supernatural within the Christian community has caused problems. Thomas Aquinas especially comes to mind. He lived in a world rife with mysticism and didn’t have a problem with it. However, he felt the urgency to add structure to this thinking. Aquinas should be considered the Patron Saint of all Charismatics, and every leader within this movement should have him for reference. Thomas Aquinas dwelt deeply on the topic of miracles and formulated the definition into various degrees in the thirteenth century. He cautions against improperly assigning a natural phenomenon as a miracle. One example he used was an eclipse. To the astronomer, it is part of a routine pattern, but to the thirteenth-century layman, it was out of the natural order and, therefore, a miracle. Aquinas assigns an eclipse as a wondrous event. One must realize that Aquinas lived in an era where mystic Christianity was in a heightened stature. He realized there was a fundamental problem and wrote out basic principles for defining a miracle. Although his work is almost 800 years old, it still has value for today. The eighteenth-century English philosopher, David Hume, among others, noted that superstition and adherence to mysticism were too strong a social constant in his society. It permeated all the theaters of decision making. From this perspective, he produced this powerful sweeping statement. He further added that miracles should not justify a system of faith.6 Miracles used to rationalize a Charismatic church or Christianity as an authentic representation of religion instead of reason delegitimizes such movements within the Canadian social mosaic. Any religious leadership that uses miracles to promote their brand may have short-term gain by preaching to the choir, but in the long term, will create more public animosity. He saw no difference in the attitudes of either the Protestants or the Catholics on the subject. The improper application of miracles and the supernatural was one of the factors that forced a social revolution that regaled against any perceived spiritual intervention. The de-supernaturalizing also had another critical factor. It deprived Church of their authority and transferred it to a new entity. As a consequence, it enabled society to establish a new set of laws, selection processes for civic leaders, systems of government, and a different framework for scientific exploration. This correction was an overreaction that downgraded the realm of miracles and supernatural into the place of myth; a piece of history that should remind present-day Charismatics to tread carefully. There is also a theological and common sense problem. If a church has regular weekly healing meetings based on the premise that miracles will happen, then this means they can suspend the laws of nature for an hour or two every week. Such a proposition displays a predictable pattern of health recovery and, therefore, a standard procedure. Such a custom is not consistent with what constitutes a miracle. A miracle is something that cannot be controlled or predicted in any way. This staged event is not a realistic premise to encourage or practice. The following YouTube video This Bible is Leaking Oil by the Gallons! Is it Proof of End Time Miracles? reminds me of classical Medieval mysticism. It appears like we are reinventing the mystic wheel. The following is a modification from Thomas Aquinas’ writing on miracles especially in his work called Summa Theologiae. Question VI addresses miracles.8 It is a difficult text to read, and one has to meditate on the words a considerable time before they make sense. The time and labor spent reading are worth it. Miracles do happen but the definition should be purposely narrow and only declared when something occurs that is obviously outside the laws of regular nature. The cure for a common cold or a back feeling better are too subjective. An amputated arm that grew back, or somebody clinically defined as dead and then suddenly brought back to life while someone was praying over the coffin, are miracles of substance. However, I have never seen anything like this happen. It is essential that churches who emphasize faith healing have a clear policy in place. An independent third party must empirically prove any miracle. Therefore, meetings that encourage divine healings should state that only a health care professional declares whether a miracle has happened. It would be difficult to describe something as spontaneous healing with many ailments. Diabetes, most cancers, multiple sclerosis, or any other afflictions are all conditions that are difficult to assess. Some can heal through natural means or can even go in remission. They can hide for long periods and then surprisingly reappear. These states can lead to false hope and potentially to premature death because a sick person who believes that a divine intervention has occurred may fail to take prescribed therapies or refuse medical treatment. There is no such thing as too much Aquinas, especially on this topic. Here are a few more details on his idea of miracles. All healings and miracles should be listed according to his system: wonders of nature, greater miracles and lesser miracles. I think Charismatics have exclusively delved in the realm of lesser miracles but this is even stretching many instances. The short of it is this: any miracle must be visibly or scientifically outside the bounds of natural law. If not, then claim it a wonder or a divine gesture. Anything that remains unproven is not a miracle. Some would counter that the positive affirmation of community prayer heals a broken spirit and can alleviate emotional suffering. This state then can cross over into the bodily realm and help those with healing. Many divine healing services succeed in encouraging people by instilling a sense of hope. Hope is hard to grasp for those who continually struggle due to a physical malady, lack financial means for the most elementary of provisions such as medications, dental work, food, or employment, or hurting through a divorce, death, or many other reasons. These are situations where many have quietly given up on life and live in the shadows. Many testimonies in healing services attest to overcoming such obstacles and finding the experience as a place for a new kick-start in life. The psychological help and inspiration of a divine hope appear to be an excellent argument for divine healing services. However, these aren’t miracles. They are words of encouragement. These last two arguments gloss over the severe trust broken by faith healers and ignore the ominous task of rebuilding it. A structural framework is required to re-establish trust and Aquinas is a good beginning. If the present stage events continue without any revision, the Charismatic Church will increasingly be marginalized and mocked by the greater society. This marginalization is a grievous place to exist. It especially negates all the other positive social contributions made by Charismatics to society in other areas. Homily on Matthew 9:32 See also: Chrysostom on the Doctrine of Tongues which covers Chrysostom’s beliefs regarding miracles. IBID Hume. An Enquiry Concerning Human Understanding. As one who has been privileged to actually see a “miracle” happen I feel compelled to make a few comments. Space and time will not permit me to go into the details of my actually witnessing a miracle. It matters not to me whether anyone ever believes me or not; I simply have to give my testimony to having seen a real divine miracle. I have also have seen many miraculous healings that have been medically verified including one with my wife where we have test results showing that she had mitral valve prolapse and one later showing she does not have mitral valve prolapse. This condition can only be corrected by surgery or by God. She never had surgery. So I am personally confident that God does indeed perform miracles and miraculous healings. My background is in Biblical studies with studies at the Hebrew University in Jerusalem. I concentrate on early Christianity and the Hebraic background to Christianity. I have worked in academic settings for years and have seen the majority of academics to be on the side of those like the professor from Princeton. Their experience is in an academic setting in the world of ideas and theories. Most are agnostic and a few atheist. They don’t believe in miracles and have never seen one nor do they ever expect to see one as they don’t believe they exist. On the flip side, I also have worked as a pastor and I have experienced many people who think that they should leave their brain at the door when they enter a church. Faith all too often means what one believes and when one wants to believe something strongly enough they sometimes create their own reality devoid of our commonly shared reality. This furthers those who wish to distance themselves from the charismatic and divine healing elements is the church. To all this I say. There is a real God who really exists and who really does miracles. He does not do miracles to entertain or merely to show He can. He doesn’t need to prove Himself to anyone. That will become self evident in time. He sometimes does miracles to proclaim His authority or to give witness to His servants. Jesus instructed His disciples to go and heal the sick. Elijah was given the keys of rain and told Ahab that it would not rain until he said so. But these instances are when God has made someone His agent and empowered him to be His witness and to speak on His behalf. This is not something you can manipulate at your own choosing or for your own glory. We do not see these things as often as we wish because we don’t give ourselves wholly to God to used by Him as He wishes. Jesus did miraculous works to promote His mission and to give witness that He was sent by God. To say that His followers can not do the same is contrary to Jesus own words. “John 14:11 Believe Me that I am in the Father and the Father in Me, or else believe Me for the sake of the works themselves. So it is convenient for academics to stay away from the miraculous because it seems nonsensical and for those who believe that God can but doesn’t to avoid the topic because it is messy and fraught with problems. But, and it’s a big but, God is the same forever and He calls His disciples to exemplify His will and His kingdom and to so walk with God that we can bring His miraculous power into ordinary lives to bring healing, deliverance, restoration and even life from the dead and to bring the power of the extraordinary into the ordinary. If we are convinced that God doesn’t do that anymore then we deny His eternal claim and if we are convinced that God could but doesn’t do miracles then we will never pray for them and never try and certainly will never see them manifest. Personally I would rather try and fail than to never try at all.